I decided today would be the day I try something new for dinner. So, I told my husband, Chris, to expect anything. If it doesn't work out, there's always veggie burgers. 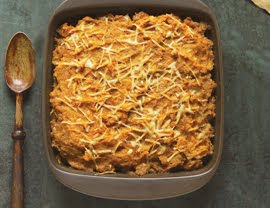 This recipe for Sweet Potato Shepherd's Pie is courtesy of Vegetarian Times. It's so easy to get stuck in a rut with our food options. Trying something new is a great way to push our boundaries right out of that rut. VT subscribers are never short on options. In addition to the magazine, VT also publishes cookbooks and more recipes are available via email. I've amassed a vast collection -- it's time to start putting it to use. I am pleased to say the turned out to be a culinary success. Try serving it with a hearty bread and a green salad. 1. Bring large pot of water to a boil. Add sweet potato, cover, and boil 10 minutes, or until tender. Drain, and return to pot. Mash with milk, margarine, cinnamon, and nutmeg; season with salt and pepper, if desired. Set aside. Cherie's note: I microwaved the sweet potato, let it cool, then peeled it carefully. It worked just fine. 2. Heat oil in large skillet over medium heat. Add onion and leek, and sauté 5 to 6 minutes, or until leek is soft. Add turnips, carrot, thyme, and rosemary; cook 2 to 3 minutes more, or until carrot begins to soften. 3. Add wine, and cook 30 seconds to deglaze pan. Stir in beans and broth. Cover, and simmer 10 minutes, or until carrots and turnips are soft. Season with salt and pepper, if desired. 4. Remove thyme sprigs from Filling, and discard. Pour Filling into 2- or 3-qt. casserole dish. Spread Sweet Potato Topping over Filling. Sprinkle with Parmesan cheese, if using. 5. Preheat oven to 375°F. Place casserole on baking pan. Bake, uncovered, 30 minutes, or until filling is bubbly and cheese has melted. Let stand 5 minutes before serving. 6. Frozen cooking instructions: Preheat oven to 375°F. Cover casserole, and place on baking sheet. Bake 60 to 75 minutes, or until filling bubbles and top is golden. Remove foil during last 10 minutes of baking. Let stand 5 minutes before serving.